In a report published by Beijing-based Legal Weekly, Chinese automaker and manufacturer of rechargeable battery BYD Company was said to have received complains from consumers about the insufficient battery life of one of its electric car models. The battery is that of the BYD Qin model, a plug-in hybrid electric sedan. The second-generation Dual Mode vehicle has an all-electric range of 70 kilometers, according to the report. Moreover, the model features a hybrid electric powertrain, reportedly able to extend the vehicle's total range to a distance comparable with a vehicle powered by conventional gasoline, the Legal Weekly added. Of the 25 complaints received by the BYD Company for the period June 24, 2014 until June 6, 2015, 10 were concerned about the insufficient electric car battery life. Most of the problems can be from the real driving range of the model--a statistic less than what the company claims. The electric car industry has been battling with the issue of cost and capacity of battery packs, hindering its advancement. Industry analyst Wang Gai said that the industry has yet to know what battery is optimal for electric vehicles: lithium iron phosphate batteries or graphene batteries. For BYD Qin, there is a 13-kWh lithium ion phosphate battery pack that serves as an energy storage provider. Since the model was unveiled in 2014, it has fared well in the market and enjoyed strong sales in the country. 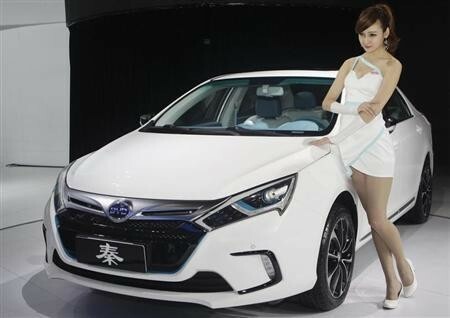 In fact, 27.9 percent of the Chinese new-energy vehicle market and 49.6 percent of the plug-in hybrid vehicle market can be accounted to BYD Qin. Furthermore, the electric car batteries manufactured by the BYD Company has secured a 9-percent share of the global market as of the first quarter of 2015. The figure is up from the 6-percent statistic of the same period last year. The BYD Qin is currently available to consumers in the Chinese and Latin American regions.